I often lament about the lack of a genuinely small, useful pickup truck in the U.S. market, like what used to exist back in the 1970s and 1980s with trucks like the Mazda B-Series or the Chevy LUV. 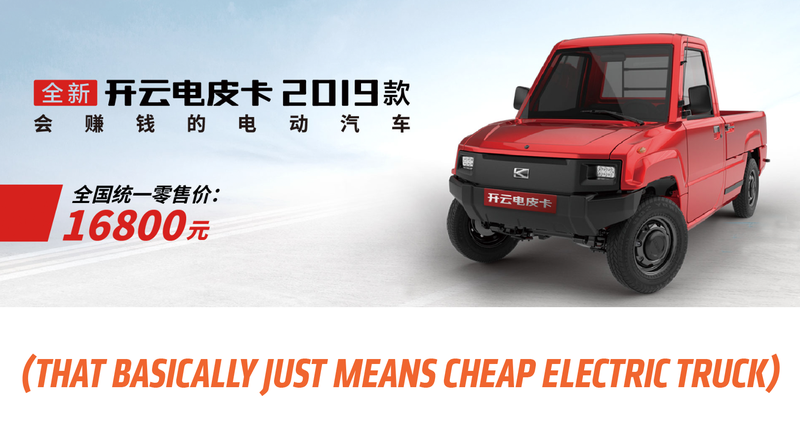 While trucks like that are pretty much gone here, a Chinese company called Kaiyun is taking steps to bring a novel and useful electric pickup truck to the U.S., and it’s only about $5,000! Well, sort of. Bloomberg reports Kaiyun Motors has gotten some manner of official approval to export its small electric pickup trucks, called the Pickman, to America, but keep in mind what we’re talking about here. These are vehicles that are classified under China’s Low Speed Vehicle category, meaning this thing maxes out at 28 mph and has a range of about 75 miles. If anyone at Ford’s F-150 division is soiling their pants, it’s for personal reasons unrelated to this little truck. Pickman trucks should not be confused with these, which are not trucks. I’m not being dismissive here; while I don’t think these will meet F-150 levels of success in America—remember, those beasts are the best-selling vehicles in America—I have no doubt that there are many niches where a little truck like this would be great. Something like this would be more comparable to Mahindra’s Roxor, in that it’s not going to be approved for actual on-street use. It’s the kind of thing that would be bought for use on college campuses, farms, ranches, zoos, rich-guy estates as a moving shooting platform to hunt the Ultimate Game, man, that sort of thing. In those contexts, I think the Pickman has a real shot at success. In China, these trucks start at around under 17,000 yuan, which is only around $2,500. Kaiyun says the pickup would sell for about $5,000 in America and $5,700 in Europe, attributing the higher cost to “reinforced structures and storage space for guns.” Man, they got our number. The design of the truck is quite good, in a utilitarian sort of way, I think. It comes in a variety of body styles, and in pickup form it appears that all three sides of the bed fold down for access, which is very useful. There also appears to be a front trunk available for tool storage or other secure item stowage. I’m especially fond of this version with the rear cargo box, which makes it feel like a tiny, electric G-Wagen or old Land Rover, sorta. It’s got suicide doors, even! If I could get away with it, I’d happily use one of these in-town as a general-use work truck—getting stuff for projects from the hardware store, hauling those projects to the dump once I admit failure and quit, take a goat for a ride, that sort of thing. It’d be really useful! I’m all for this. Come on over, little Pickman!